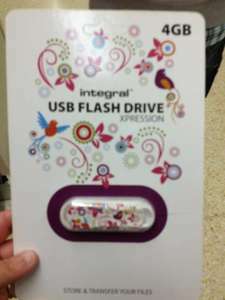 Went to my local Sainsburys yesterday (Huddersfield) looking for a laptop, and bought this 4GB Integral Flash Drive - £1.99. Bargain - Just looked at Argos and they are £9.99 there. Other places online are about £6. This is the cheapest I've seen it, not sure if it's just local or national, but still a good bargain. Much cheaper than a laptop as well. Cool, hopefully this is nation wide. 50p per GB is the going rate at the mo. 4GB is rather small though in todays age. Found none at Oldbury store, they had others on sale but none this cheap. not bad, but I picked up four 32Gb usb sticks at mu local sainsbury a couple of weeks back, £3.99 each! not bad, but I picked up four 32Gb usb sticks at mu local sainsbury a … not bad, but I picked up four 32Gb usb sticks at mu local sainsbury a couple of weeks back, £3.99 each! Sainsburys are having some great deals, but its luck if you get them. Just like the Tesco deals last year.. It was at the Huddersfield Sainsburys near Queensgate/the uni. shorehead one by the sounds of it. hmm, not sure why i need one but £1.99 is good! shorehead one by the sounds of it. hmm, not sure why i need one but £1.99 … shorehead one by the sounds of it. hmm, not sure why i need one but £1.99 is good!